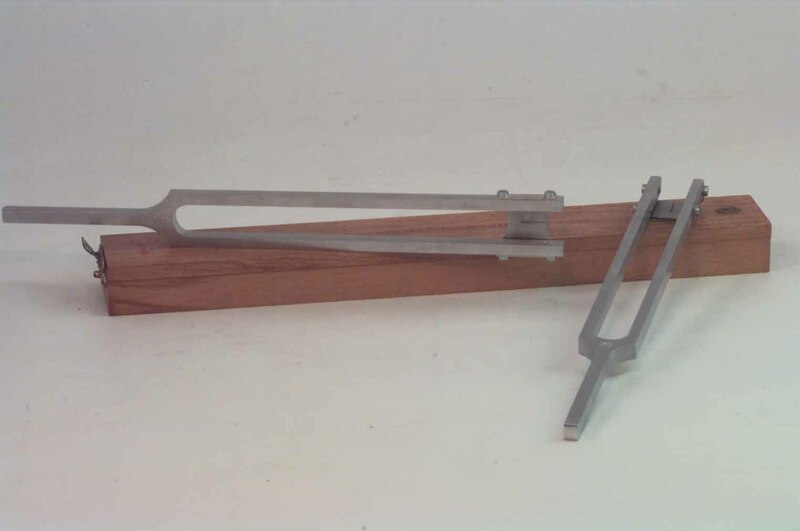 The stroboscope is essentially a more complicated variation of the tuning fork. At the top of the instrument, there are two steel plates (or diaphrams); each with a slit at the centre and overlapping, which are clamped at the end of the two prongs, by means of screws. The stroboscope is 23.5cm in length, 2.5 in width and comprised of steel. When the two prongs are at rest, the overlapping slits are perfectly aligned so that light may pass through both. If the fork is then caused to vibrate, it is possible to see through the slits twice in each complete period, that is, 2n times per second, where n is the frequency. Hence the stroboscope is used in many instances to accurately determine frequency as an object vibrating or rotating at the same frequency will appear stationary when viewed through the slits. E.G.Richardson, Sound A Physical Text Book, Edward Arnold Publishers LTD, London, 1953, p79. B.L.Worsnop and H.T.Flint, Advanced Practical Physics for Students, Methuen and Co. LTD, London, 1957, p 335.